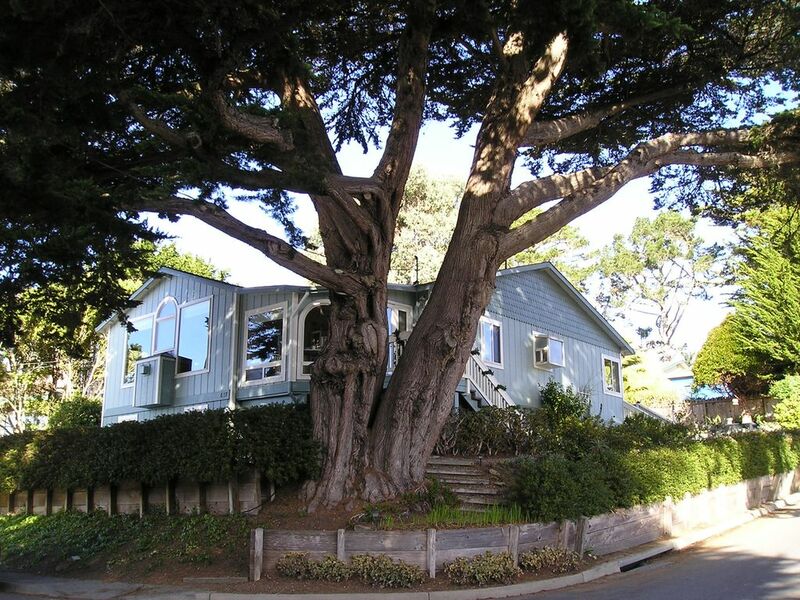 Moss Beach House with spectacular Ocean View and walking distance of beaches. The house is great for families, business conferences, or private vacations. It is on a corner lot with an attached two-car garage, a backyard private garden and patio with flowers, fruit trees, BBQ grill, smoker grill, a Franklin Stove for cool outside evenings, and a front ocean-view garden with a romantic under-the-porch swing and a stunning panorama of the coast. A large, bright, and cheery Great Room with oak-beamed cathedral ceiling and a sun room sheltered under a huge heritage cypress tree have large picture windows with spectacular white-water ocean views, an attractive gas fireplace, grand piano with music library, and an antique pump organ, an expandable dining table and plentiful chairs. In this Great Room you will also find a cable/sat TV, Hi-Fi/DVD, plentiful bookcases and books, puzzles, and games of all types. In the kitchen area are custom oak cabinets and granite countertops with all modern appliances and two separate sinks with disposals, and in the cabinets and drawers are ample dishes, flatware, and glasses, and also plenty of cooking pots, pans, and baking things, cutlery and cooking utensils. There are two full baths and three colorful bedrooms with closets and storage shelves for guest needs ---1. has Queen bed and large wall unit and a TV; 2. has Queen bed, skylight window, bookcases and a large desk; and 3. is a studio with a double Sofa-bed, small work table, and chest of drawers--- enough beds to sleep six people, but in addition there are two inflatable twin mattresses, a large LR sofa, and a Porta-crib. For small children there are a high-chair, umbrella stroller, toys, and children's books available. In the attached two-car garage you will find the clothes washer and dryer, a laundry sink, hot-water tank, linen storage cabinet, a small refrigerator and ample tools and gardening equipment, paper goods and supplies for the house, and the containers for recycling and trash, also lots of beach equipment and assorted items for storage. Please no pets, and no smoking in the house, however the man of our house is known to smoke cigars on the patio! We are originally from Louisiana and Texas, have also lived in NYC and in Germany, are retired teachers of music and math/science, with long years of musical performance on piano and other instruments, and choral directing. Backgrounds include graduate degrees and scientific research. Three adult children who reside with their families in the Bay Area or in Illinois are all professional performing musicians and teachers of music. One of us is also an artist with paintings in many exhibits and shows. Lived in Los Altos CA for 20 years where we raised our kids and decided to relocate on the Coast for a change of pace after our they grew up. We have never been sorry for that move! The house needed upgrading and the garden was a disaster, but we made it a comfortable and attractive home, or so our family and friends all tell us! Close to our family and friends, beautiful coastal scenery and the availability of walks along the seashore, easy drive to San Francisco and other places in the Bay Area. A small local airport and the SF Airport are nearby, also several nationally ranked sports teams, opera and symphony and art museums in San Francisco, and outstanding universities such as Stanford and UC Berkeley. Silicon Valley, Wine Country, the Sierras, and several National and State Parks are nearby. Agriculture fields in the vicinity growing brussels sprouts, artichokes, flowers, and other things. Reefs and tidal pools at the FItzgerald Marine Reserve in Moss Beach. Many more beaches north and south along State Highway 1. World-class golf courses just south of Half Moon Bay on State Highway 1, about 8 miles from our house. Another Sharp Park Golf course is on the highway in Pacifica, about 5 miles north. Very wide view from our windows and the neighboring streets of the Pacific Ocean. Sweeping view of Pacific Ocean from our windows. Washer and dryer and utility sink located in garage. Driveway and curbside and parking areas on street. Bath towels in cabinet or drawers in both bathrooms. Kitchen towels in lower drawer in kitchen. Large living-dining great room with picture windows giving wide view of Pacific Ocean. Ample seating on couches and recliners, TV cabinet , grand piano, pump organ, bookshelves, recumbent bike. Gas stove top with electric oven and warmer drawer. Staples and canned foods in pantry and upper cabinets may be used and replaced as needed. Modern kitchen with granite counter-tops and back-splash, two sink areas, both with disposals, three coffee machines, small appliances. Large oak table with pull-out extensions to seat 8-10. Ten dining chairs available. Many books on shelves in living room and all three bedrooms. Large quantity of music on shelves behind piano. We are musicians! Under the piano for smaller children, games, puzzles, and children's books on bookshelves. Side garden next to Comus Street has many blooming shrubs and roses. Back garden has tall trees, fruit trees, flowers, herb garden, canopy over large table with seating for 10 people. Small seating area on balcony adjacent to sunroom and swing below for relaxing and viewing the ocean. Small deck outside the enclosed sunporch/office, both with excellent ocean views. Normal utilities include gas and electricity, Cable / Disk TV and Internet WiFi, water with auto sprinklered gardens, weekly trash and recycling pick-up. The home is completely furnished with all linens, dishes, and kitchen supplies, including instant hot water, gas stove with electric dual-convection oven, blender, Cuisinart, microwave, counter-top grill, Crock-Pot, toaster-oven, expresso machine, and coffee maker. The washer and dryer, laundry sink, small refrigerator, linen cabinet, and tools are located in the two-car garage. Monthly garden service is included and also regular housekeeper is available for longer stays at the renter's expense. Nice comfortable house in a great location that is not too far from SF and Stanford. The house has great views and its walking distance to the nature preserve. It is in a very quiet peaceful safe neighborhood. The owners were attentive. I would stay here again. Thank you, Nancy, for you lovely review of your stay in our home! You are welcome again any time! The home was very clean and quiet. My family felt comfortable there. It was the perfect location for me and my family to travel to many locations both in and outside of San Francisco. The beaches nearby were beautiful. Thank you for your very positive review! We are pleased that you enjoyed being in our home and our beautiful area of the country and hope you will come back again. Our stay at the Moss Beach house from 9-23 to 9-30 was great. The house was very comfortable, and had beautiful view of the Pacific. The location was also perfect for visits to Half Moon Bay and San Francisco. Would Stay again. Great views of the Pacific. Highly recommend! Plenty of room with 2 baths and 3 bedrooms, plenty of living space to relax, the gas fireplace is a great feature, and the views are amazing of the Pacific. The outside Franklin stove for a fire was a nice feature also. Thank you for your warm comments about your stay in our home. We hope you will come again! While visiting family in the area, we had a wonderful stay in this beautiful home overlooking the sea. The house was extremely lovely, clean and comfortable and we were in a terrific location for site-seeing both in and out of SF. Linda and Charles were great hosts. We hope to visit again soon! The house is located in Moss Beach in a quiet neighborhood two blocks uphill from Highway 1, which follows the Pacific coastline. There are a nice small grocery & liquor store, a post office, a wine bar, three restaurants, a light house, a fire station, a Sheriff's office, and an emergency hospital, all in the small village of Moss Beach. Nearby are beautiful hills, bluffs, beaches, and tidepools within walking distance, and also kayaking, surfing, golf at Ocean Shores golf courses, ocean fishing or whale watching from the Pillar Point Harbor where you can buy Dungeness crabs and fish off the boat, or eat fresh fish or a variety of international foods at some of the best restaurants in the Bay Area, attend the famous October Pumpkin and Art Festival, and visit a variety of shops in nearby in Half Moon Bay. There is even a nearby airport for small planes and a wonderful restaurant for breakfast or brunch. There are big hills surrounding the SF Bay Area and good hiking trails on the Montara mountain trailhead 3 minutes away, horse riding, bicycle riding, and walking on Coastal Trail, tidepools to visit at Fitzgerald Marine Reserve only a 5-minute walk away (contains marine life typical of the coast and is visited by school classes and people from all over the world), and just above the Reserve is a unique cedar forest, site for a couple of movies, overlooking a large group of seals sunning on one of the most beautiful white sand beaches in the world. The small village of Moss Beach has a quiet location near farms of flowers and vegetables, with local produce stands scattered about. The entire area is scenic and attracts many artists to paint the views. The drive to downtown San Francisco takes 25-30 minutes, 30 minutes to SF Airport or Peninsula cities and trains. And if you want to see California attractions a bit farther away from the coast, the drive by car is 1-1/2 hours to the Napa/Sonoma Wine Country or the Monterey / Carmel Peninsula, and the Sierra Nevada mountains, Yosemite National Park, and the Gold Rush Country are a 3-4 hour drive from our coast.